Ancient Greek myths are very interesting, and the characters in them are extremely charismatic and diverse. And one of the most interesting characters from the ancient Greek myths is Medusa Gorgon. As you most likely know, this is a monster with a female face and snakes instead of hair. Her gaze turned a man to stone. 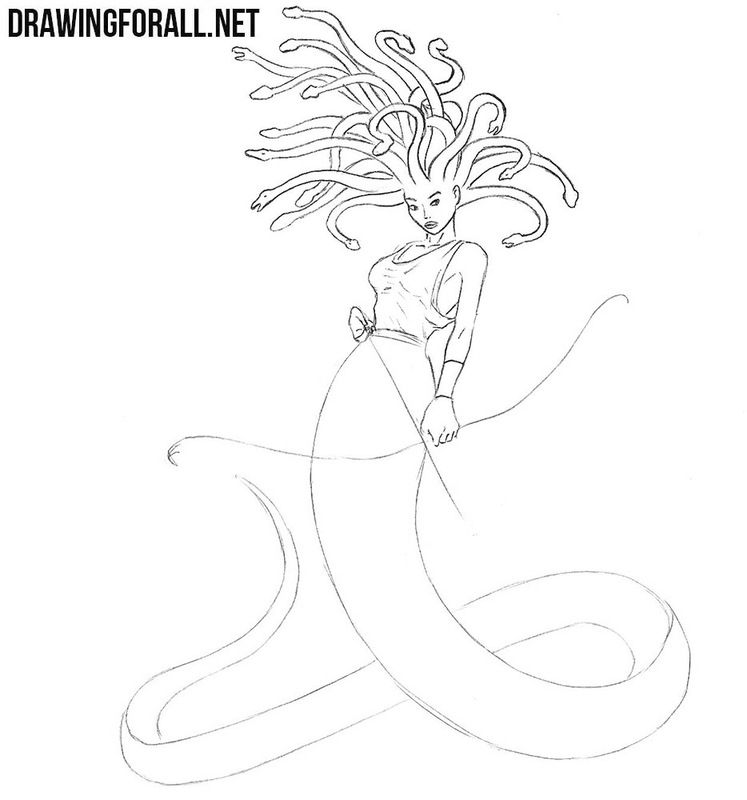 So, let’s start this lesson and learn how to draw Medusa. The image of Medusa Gorgon varies in different works. We decided to draw a collective image of this monster. 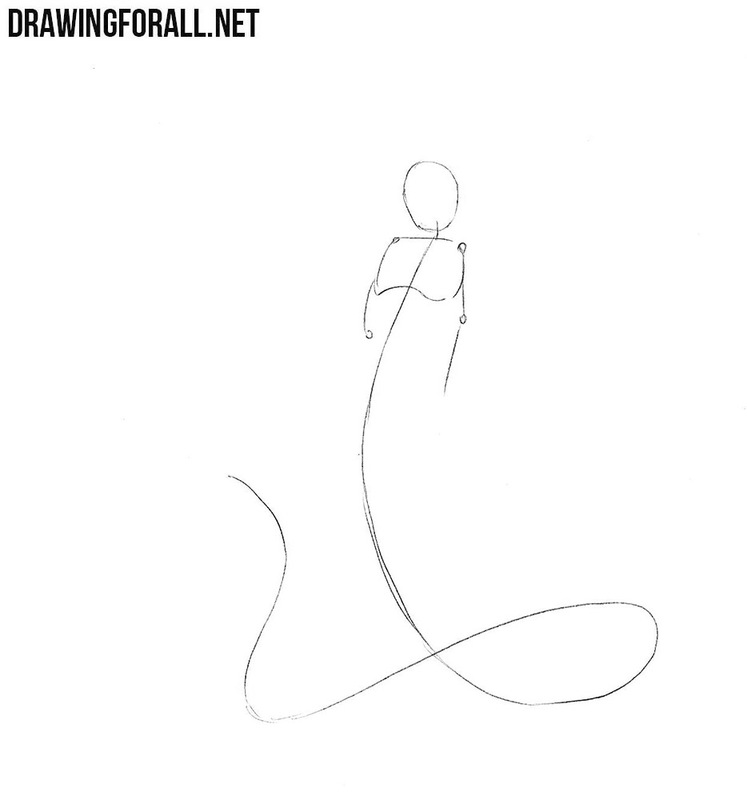 In our example it will be a girl with a beautiful face and a snake tail instead of legs. 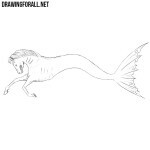 So sketch out the head in the form of a circle, then the line of the spine, which goes to the tail. Next, we sketch out a chest and arms. Let’s now outline some details in the figure of Medusa. 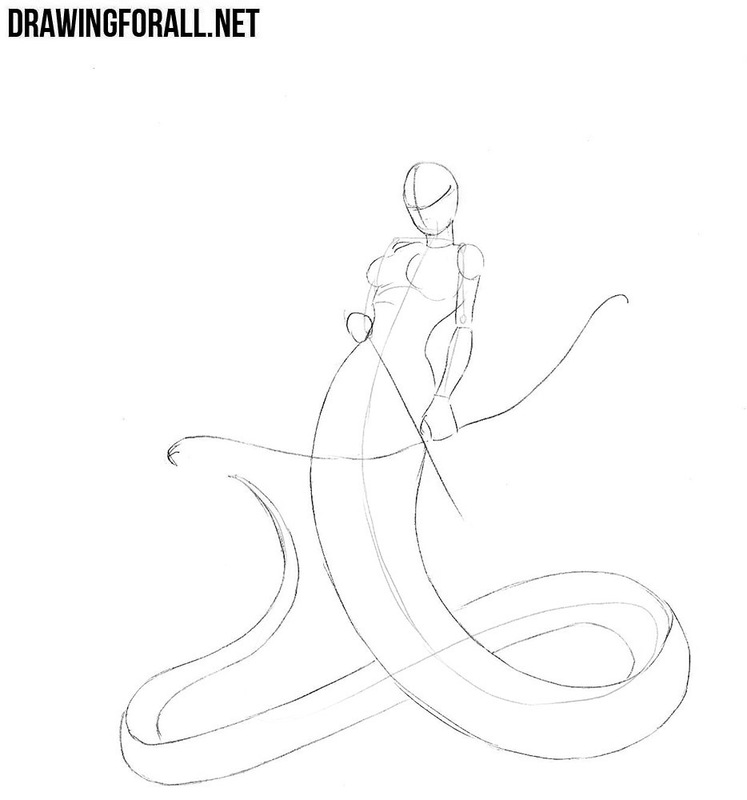 Sketch out long snakes on the head with the help of wriggling lines. Next, outline the features of the face. On the torso sketch out clothing and belt on the waist. Let’s now work with the details on our Medusa drawing. Carefully draw out the features of the face: eyes, a neat nose and plump lips, guided by intersecting lines from step number two. Also draw contours of the face and erase all unnecessary guidelines. 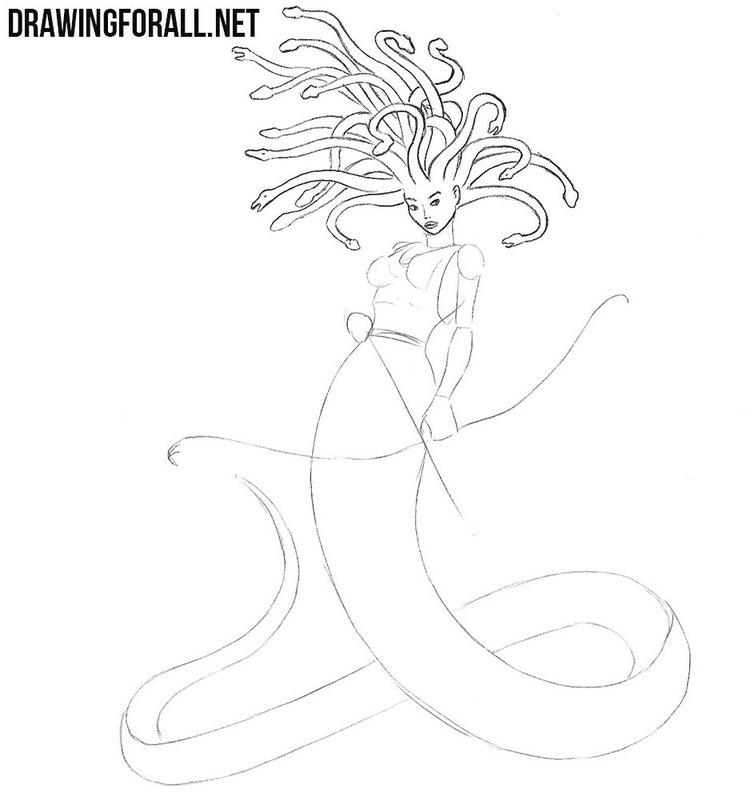 Now the most painstaking step of the lesson about how to draw Medusa Gorgon. 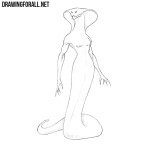 Here we need to draw snakes on the head of our character with the help of long and curved lines. Here you need to try not to get lost in the lines and details. The head is drawn, and it’s time to move on to the torso. Carefully draw out the neck that goes into the torso of our Medusa. Next, draw clothes on the torso, considering the curves under the cloth. Do not forget to sketch the folds as in our example. Continuing the lines of the torso carefully draw out thin arms. Be especially careful when you draw the fists, since there are many small details. On the forearms draw bracers and remove all unnecessary guidelines from the arms. Now draw the outlines of the curved bow and straight arrow. 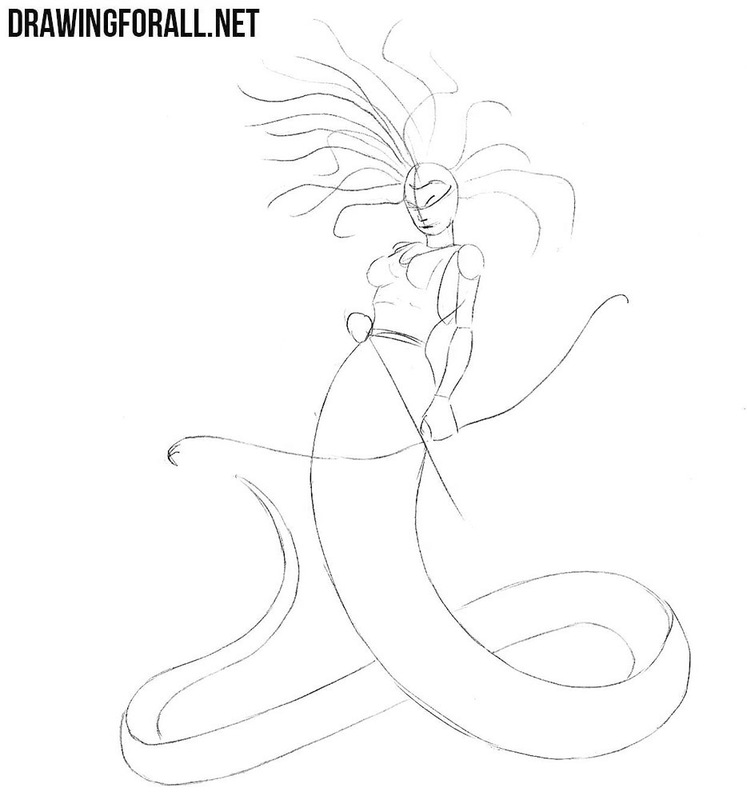 In the same step, draw out the outlines of the hips and the long snake tail of Medusa, using dark lines. Remove all remaining guidelines and go to the shadows drawing process. So, let’s now draw shadows on the body of our Medusa Gorgon, using hatching of different density. Shadows should be in the least lit areas. Also, you can draw shadows in the style of comics, as in our lesson about Mysterio. 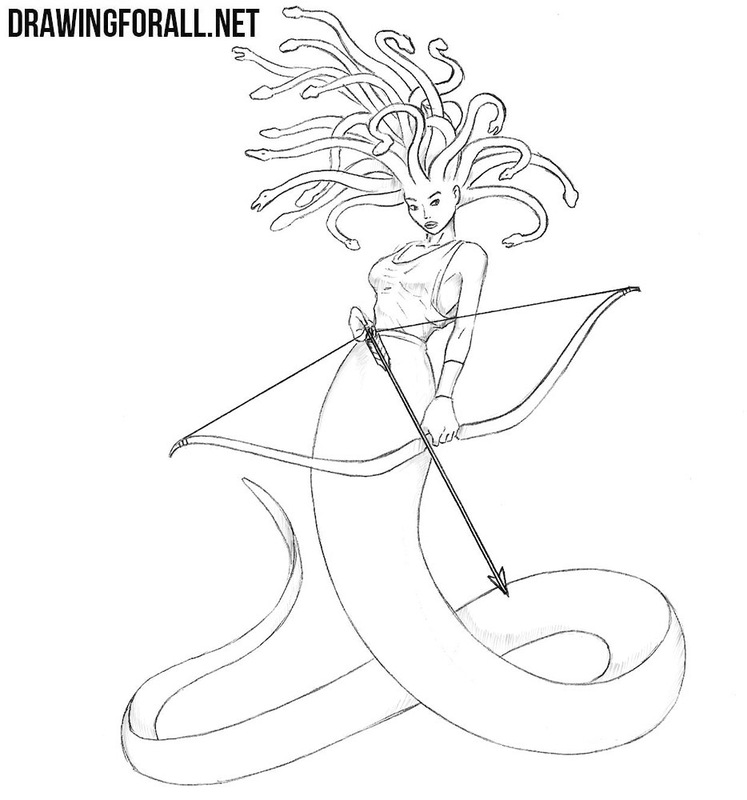 Medusa Gorgon is one of the most interesting characters from ancient Greek mythology, and now you can draw her. If you are interested in other characters from fantasy and myths, then be sure to visit our category called “Myths and Legends”.